Flip & Doodle’s dual design features an upright easel that folds down into a desktop. The art easel features a metal dry-erase board that can also fold down to create a large 13" x 20" work surface. The desk includes molded-in shelves, trays, cup holder and six multi-size bins for storage. It even comes with an 11” stool. This product is a 2007 Parent's Choice Award winner. Launch date: June 2007. Tall Stacker Pegs Building Set by LAURI, a division of PATCH PRODUCTS INC. Winner of a Parents’ Choice Award, this three dimensional stacking set teaches children to think ahead as they plan where they will set the next peg to build the next platform. Kids will not only learn about shape, size and color relationships during the building process, but they will also hone their motor and math skills. The set includes 100 Tall Stacker Pegs, a 1,100-hole peg board and 17 Crepe Rubber Shapes all packaged in a quality storage box that comes with a handle for easy transport. Launch date: April 2006. — This item is a best seller at Juggles in Wakefield, R.I., according to Owner Idanna Smith. In this story, a little octopus is teased for her ability to change colors; when she uses this same ability to save a little angelfish, however, she becomes a hero. This CD-ROM, part of the Webs to Whales Nature Tales series (winner of the 2007 Teacher’s Choice Award for the Family from Learning Magazine), introduces kids to an amazing variety of coral reef animals. Interactive lessons, with narrated text and hundreds of photos, cover octopus anatomy, mollusks, food webs, reef conservation, animal camouflage and octopus physics. The CD includes interactive games, printable activity sheets and a teaching guide. "This product combines reading, science and technology. You get a wonderful story with interactive software that teaches the science behind the story. [It's a] great product for homeschoolers," Cheryl Block of Block Publishing told TDmonthly. Launch date: June 2007. Winner of Parenting Magazine’s Video of the Year Award, this DVD features classical instruments matched to different animals. An elephant lumbering to the sound of a guitar and a frog hopping to the sound of a clarinet are just two examples. The colorful images build in a unique, puzzle-like fashion as each scene progresses, at a pace developed specifically for young children. The DVD includes interactive story cards that can be played on a television set with a remote control. This movie runs approximately 30 minutes. 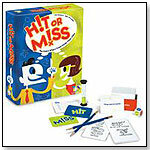 In this quick-playing game, three to eight players must sharpen their pencils and intuition. A player draws a category card and in 45 seconds, everyone lists as many related words as come to mind. The player then rolls the die. If it lands on HIT, that player picks a word he thinks everyone wrote; if it’s on MISS, he picks a word he thinks only he wrote. The highest score wins. This product received a 2007 Mensa Select award, a 2007 iParenting Media Award, a Dr. Toy Best Product Award and the National Parenting Center Seal of Approval. “Enforcing creativity, imagination, language and vocabulary development, this box of fun pushes its players to be in tune with each other,” Erin Smith of Aigner Associates told TDmonthly. Launch date: March 2007. Ernie Fire Engine comes to the rescue with his powerful friction motor and crew of firefighters. Little firefighters can ring his push-button bell and watch his revolving light before using the click-and-turn ladder to fight any imaginary blaze. The firefighter’s hand opens the back door to reveal two emergency barriers. Ernie is great for long-lasting role-play fun. — “Wow is an excellent line of cars, especially for the 1- to 1½ -year-olds,” said Fred Rosenberg, owner of On the Park in Kingwood, Texas, in spring 2007. “It’s hard to find things as well made as [Wow] that you can actually sell to that age. In the fall , we brought them in, and they’ve done very well.” They’ve also become a best seller for Brain Station and Tree Town Toys in Ann Arbor, Mich., Owners Hans and Tricia Masing told TDmonthly in fall 2007. — “This is my baby’s favorite toy. She plays with it every day,” shared TDmonthly's Baby Roundtable reviewer Sharri Hefner. She and her co-reviewers voted Ernie No. 1 for lasting value out of the 12 toys they evaluated from March to July 2007. — Ernie Fire Engine is full of “wow” for toddlers — from its friction-prompted motion and siren to its friendly face and likable figurines. Doors that open and close, a workable ladder and attractive packaging also contributed to its receipt of a TDmonthly Top Toy 2007 award. Saving trips to the store to buy batteries (it doesn’t need them) helped, too! Corolle’s 17", multilingual baby doll communicates in French, English, Spanish or Italian. Through a simple, well-hidden and secure battery system, little girls can activate Lia’s language skills using different Corolle charm bracelets. Specific, gentle touches and tickles to Lia result in endearing, realistic responses. She is dressed in velour pajamas and a cap. Accessories include a bib, bottle, pacifier, teddy bear and charm bracelets. AAA batteries are not included. ― “I like working with … Corolle as I can order only what I can use for the time period,” Owner Patti Tepper-Rasmussen of Learning Tree Toys in Oklahoma City, Okla., told TDmonthly in spring 2007. — “I think people want more interactive dolls,” said Nellie Fais, owner of Toy Magic in Bethlehem, Pa. Twenty-seven of 62 retailers said in spring 2007 that Corolle is their best-selling doll brand, with sales ranging from six to 25 units per month. Corolle’s Lia and Lila are best sellers for Brain Station and Tree Town Toys in Ann Arbor, Mich., Owners Hans and Tricia Masing told TDmonthly in fall 2007. Kids can now create a huge feast in their own kitchen with the Alex In My Kitchen playset. When they're done baking up a storm, and a mess, they can clean it all up using the built-in sink. Pots and pans can be hung up on hooks. The playset is perfect for little chefs trying to emulate their favorite adult mentors. Accessories are sold separately. In My Kitchen has also received the National Parenting Center's Seal of Approval. — "We sell a lot of kitchen type things for boys and girls, including the Alex Kitchen," said Teri Soelter, owner of Teri's Toybox in Edmonds, Wash. Winner of numerous national toy awards, including Dr. Toy 100 Best Products, Teacher’s Choice Award, Learning Success Outstanding Resource Award, and The National Parenting Seal of Approval, the Young Scientists Club offers 36 different science kits that all interlink. The kits are designed for age-appropriate learning and fun, and allow parents to help nourish their children’s inquisitive minds with real science experiments from recycling to polymers. Kits are priced at $11.99 plus $4.95 shipping and handling. Kits are mailed on the 1st and 15th of each month. Once- or twice-a-month delivery is available. Three prepaid online specials include buy 12, 24 or 36 kits and receive one, two or three kits free, depending on the order. Winner of a JMPA 2007 Innovation Award and a 2007 Seal of Excellence from Creative Child Magazine, the twin stroller has many features geared toward both parents and children. The stroller features a lightweight aluminum frame, cup holders, an oversized storage basket, peek-a-boo canopy windows, “Comfort-Padded” reclining seats, an “Ultra Compact” fold, an "Easy Steer" handle and a "Room-to-Walk" rear center wheel that leaves more room for walking and offers the longest stride of any twin stroller currently available. It comes in Charcoal, Red Tech and Terra Cotta. 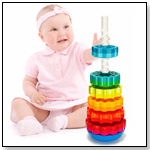 It is designed for babies 3 months and up and can support up to 130 lbs. weight. Viewing products 1041—1050 out of 1181 products.